PISIDIA. Kremna. Circa 1st Century B.C. Æ. 3.82 gm. 15.5 mm. 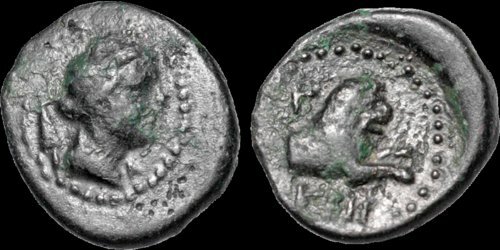 Turreted head of Tyche right, spearhead behind / The forepart of a lion leaping right; Γ above left, KPN below. SNG Copenhagen 136. Very Fine; attractive green patina.